Thebizarre arrest of NASAastronaut LisaNowak Monday cast in sharp relief the guidelines governing civilian andmilitary spaceflyers. Police arrested Nowak,a U.S. Navy captain and mother of three, in Orlando, Florida earlyMonday, where she is charged with the attempted kidnapping of a romantic rivalfor the affections of NASAspace shuttle pilot William Oefelein. Nowak also faces a charge of attemptedfirst-degree murder based on items recovered by police at the time of herarrest, Orlando police saidTuesday. BothNowak and Oefelein, a Navy Commander, are active U.S. Navy personnel attachedto NASA, a civilian space agency overseen by the U.S.government. Each of those government organizations has its own guidelines forappropriate and lawful work-related behavior. NASA’sbehavioral guidelines align with standard government rules. Active U.S.military personnel, meanwhile, are subject to the Uniform Military Code ofJustice, which governs fraternization, conduct unbecoming an officer, and otherregulations. NASAhas specific codes of astronautconduct for spaceflyers living and working aboard the International SpaceStation (ISS), but on Earth the agency’s reach is purposely limited totheir professional activities. “Thereare rules as far as being government employees, but NASA doesn’t monitoror restrict the private lives of employees,” NASA spokesperson KylieClem, of the agency’s JohnsonSpaceCenterin Houston, told SPACE.com,adding that the guidelines are currently expected to remain unchanged. Privatefraternization among astronauts is not prohibited, NASA officials said. SomeNavy officials believe any additional charges for Nowak beyond the currentcivil allegations would likely await the outcome of the civil proceedings, oneU.S. Navy official said. Accordingto police and wire reports, the 43-year-old Nowak believed another womanColleen Shipman was romantically involved with Oefelein, who is unmarried and afather of two. Nowak then drove 900 miles (1,448 kilometers) from her Houston home to Orlandoto confront Shipman early Monday, according to her arrest affidavit. Nowakservedas a robotic arm operator during NASA’sSTS-121 shuttle mission in July 2006, a spaceflight that marked the spaceagency’s return to orbiter flight. Oefelein pilotedthe space shuttle Discovery’s STS-116shuttle mission in December 2006. Accordingto GeorgeAbbey, the former Director of NASA’s Johnson Space Center, home tothe Astronaut Corps, instances of fraternization did occur but no more or lessthan in any other large private sector organization. 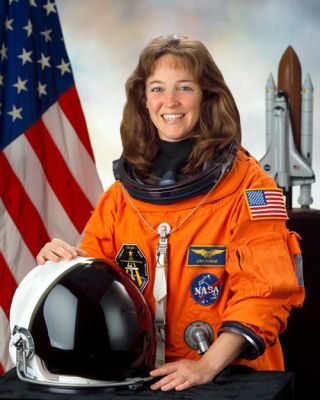 Abbey was JSC directorfrom 1996 to 2001, and had worked with NASA since 1967. A controversial figurein some quarters, Abbey was known for his devotion to the astronaut corps. Thoughnot aware of all the details surrounding the Nowak incident, Abbey said thatrules and procedures need to be in place so that NASA management can intercedebefore things get out of hand. Clemsaid StevenLindsey, NASA’s chief astronaut in the Astronaut Office, and shuttlepilot ChrisFerguson are currently with Nowak in Florida.Ferguson is a seniormilitary astronaut within NASA’s Astronaut Corps, she added.